(5) Pocket, stacked design to maximize counter space. Features notch pocket for easy access. 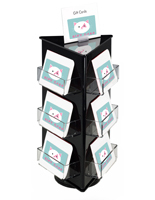 This card holder is sure to keep your gifts cards organized. 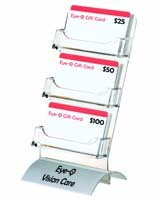 The gift card rack features 5 pockets for accommodating many cards in one compact unit. 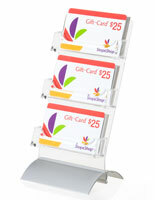 Each pocket of the vertical business card holder fits standard-size gift cards (3-3/8"w x 2-1/8"h). This prepaid card holder is made from clear acrylic for durability; the clear construction allows it to easily match any tabletop or countertop area. The card holder also features notched pockets for easy access to the gift cards. 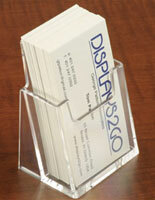 This card holder is an inexpensive card display. 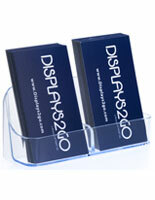 Its unique features and ideal price make this card holder the ideal prepaid card display solution. 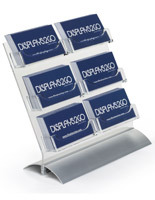 This card holder is suitable for use in any retail stores, offices, restaurants and bookstores. This card holder is a great addition to any tabletop area! 2.5" x 9.9" x 4.8"
2.1" x 3.5" x 0.5"
It's pretty hard to find card holders for business cards printed vertical rather than horizontal. 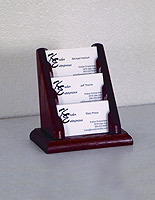 This card holder is durable, practical and can be wall mounted. We use these at our teller stations, and it's the perfect solution for tellers needing ready access to 5 different cards. 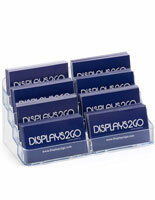 Thanks, Displays2Go! We're so glad we had just what you needed, Tracey! Thanks so much for shopping with us. We have vertical business cards and always have several at shows. So this was a rare find and happy to have it!